Two Palestinians were injured early Wednesday, from Israeli gunfire, as scores of Israeli settlers forced their way into Nabi Yunis Mosque, in the southern West Bank town of Halhul, north of Hebron. Security sources confirmed that Israeli forces escorted a convoy of buses packed with scores of Jewish settlers into the site, located in the Palestinian-controlled Area A, sparking confrontations with Palestinian residents. 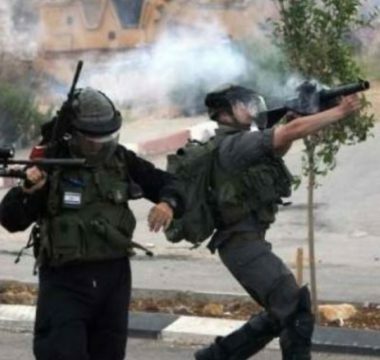 Soldiers opened fire towards Palestinians protestors, according to WAFA, injuring two with rubber-coated steel bullets, and causing dozens others to suffocate from tear gas. One injury was reported as serious. Considered the highest inhabited place in Palestine, Halhul extends over a mountainous area north of Hebron’s mountains, at an elevation of 916 meters above the sea level. Muslim tradition holds that Nabi Yunis (Prophet Jonah) is buried in this town, and the Nabi Yunis Mosque was built, by al-Malik Mu’addam ‘Isa bin al-Malik al-‘Adil al-Ayyubi, over the burial site in 1226.